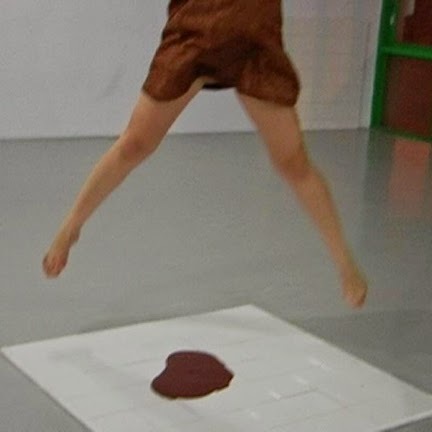 Michal Samama is a performance artist who, according to her bio, creates "body-based art works that incorporate movement, sound, objects, text, installation and site-specific practices....In my works I seek the space where opposites overlap. I explore how weakness, at its most extreme, utter vulnerability, uncovers a peculiar, uncanny power. I do that by creating obstacles for myself, actions to perform on stage of which I could never achieve full mastery, and keep me exposed to the possibility of failure. This structure produces images that are at the same time humorous and disturbing and evoke a sense of insecurity rather than comfort and ease...My aim is to trigger, in my most intimate, private, almost idiosyncratic images, the texture of the scars the collective leaves on the individual body, in my very flesh. It is there at my most intimate that I find the traces of collective memory, the hidden choreography of our life, for which there is no author...Much of my research is devoted to the tension between the ephemeral and the eternal; performance art and visual arts; I test the power but also the risk and uncertainty of live-presence with its ephemeral, passing quality against the static quality and the possibility of perpetuation in the visual arts." Wow, most of that fancy intellectual talk went over my head but it sounds like her performances must be some really deep, philosophical stuff. Let's take a look.